Border less CPU and RAM Meter Chart Gadget is nice looking CPU and RAM Meter Gadget for Windows PC and it runs on XWidget Engine. Border less CPU and RAM Meter is a minimalistic system information meter that draws resource consumption artistically. This XWidget gadget is developed by xwidgetskin. Previously we posted a post on XWidget. You need to install xWidget from that previous post for this Border less CPU and RAM Meter Chart Gadget to be working. 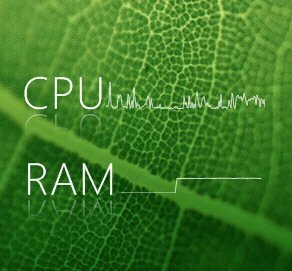 Download and double click to install Border less CPU and RAM Meter Chart Gadget. It is a RAR download, 25 KB in size. This Article Has Been Shared 7084 Times! Cite this article as: Abhishek Ghosh, "Border less CPU and RAM Meter Chart Gadget for Windows PC," in The Customize Windows, April 26, 2012, April 25, 2019, https://thecustomizewindows.com/2012/04/border-less-cpu-and-ram-meter-chart-gadget-for-windows-pc/.